When Chris Bell made a move to Sale Sharks, he took some time out to have a quick catch up about his ideal woman, waxing, finally entering the digital age, and his ‘epileptic’ music taste. 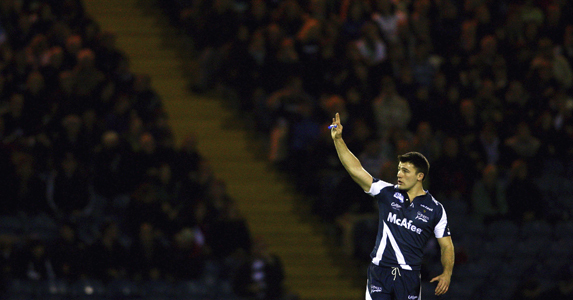 RUGBY WORLD: You’ve been at Sale a few weeks now, so how have you settled in at the club? CHRIS BELL: I knew a few of the guys here before I came – Magnus Lund, Richard Wigglesworth, Andy Titterrell, Chris Jones, Stuart Turner, Dean Schofield. It’s handy to know people because it breaks down barriers when you first arrive. Pre-season’s gone well, although I did twist my ankle and had to have a few scans to check the screw in my foot hadn’t moved. RW: Does having a screw in your foot mean you beep when you go through X-ray machines? CB: I thought I would, but I don’t. I was a bit disappointed, especially as it’s a big old one. It was put in when I broke my foot during last year’s pre-season and it’s actually three inches long. RW: Have the Sale boys made you do anything as an initiation? CB: I had to sing a song on the bus after the Biarritz pre-season game. I did Good Riddance (Time Of Your Life) by Green Day. I listened to it all week on my i-Pod so I could try to remember the words!I was out of key, out of time and forgot some of the words, but managed to get through a verse and a chorus without getting booed, which was the main thing. It was so bad it was almost good! RW: So what music do you like? CB: My girlfriend, Elle, just bought me my i-Pod – so I’ve finally entered the digital age. I was a bit prehistoric before with all my CDs! I’ve got loads of different stuff on there – Jack Johnson, Sublime; I’ve got eclectic music taste. Once in an interview I said I had epileptic taste! RW: Do you like breasts, bum or legs? CB: Ideally the whole package, but primarily a good bum! My ideal woman would look like Elle Macpherson and cook like Nigella Lawson. RW: We all know Gav shaves his legs – do you shave/wax any body parts? CB: Only my face. I’m getting badgered to have my back waxed by my girlfriend, but I’m going to hold out as long as I can. RW: What’s the most you’ve spent on something, apart from a house? CB: I spent £9,000 on my car and I’ll probably spend more on my new one. I want a 4×4 – I’m very messy and my car is full of crap. Saying that, I’ll probably just fill the bigger one with crap! I spent £1,700 on a sofa. When I broke my foot I was lying on my sofa for two weeks and I realised how uncomfortable it was. As soon as I could walk I went and picked out a big corner sofa. The problem was it didn’t arrive for ten weeks so I still had this rubbish sofa to sit on while I was injured and by the time it came I was fit. CB: Going to rugby training when I was four and a half, seeing people play, then telling my dad I didn’t want to do it because it looked really rough! Six months later, I went back and did it. RW: What’s the funniest thing you’ve ever seen happen in a match? CB: Watching a game in Ireland once, the rain was coming down so hard one of the wingers was standing behind a post protector to keep warm! RW: Didn’t something pretty funny happen to you at the Churchill Cup – or should that be embarrassing? CB: It had been dry all week but on the night before and morning of the game with Scotland A it was lashing it down. So, when I got the ball out wide near the line, instead of stepping inside I decided to hit the ground and slide in. But it wasn’t wet enough and I only made it a couple of metres. I tried to convince the ref I’d crossed the line but he knew I hadn’t. I got ribbed a lot for that.